Hand Juicer vs. Electric Juicer: Which is the Best for You? 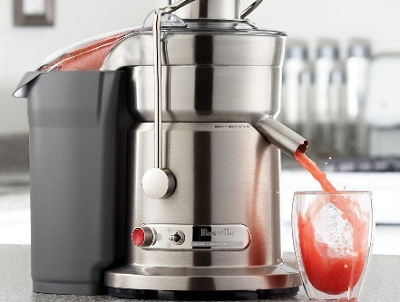 Home » Best Juicers » Hand Juicer vs. Electric Juicer: Which is the Best Juicer for You? Once you decide to start juicing, you have to decide whether you want a hand juicer or an electric juicer. There will be many other decisions to make once you settle on a basic type of juicer, but it all starts with this one decision. It may be a clear cut decision to some, but if you don’t know a lot about juicers or aren’t sure about your exact needs it can be difficult. The first thing you need to do is determine what your expectations are from the juicer. What goal are you trying to achieve with it? Once you know this, simply understanding the benefits of both juicer types will help you determine which one is right for your needs. Hand juicers are often called manual juicers. They do not need to be plugged into the wall, which makes them the natural choice for travel or use away from home. They are also very easy to use for the most part. Most will require a basic squeezing or pressing motion, but they still apply a lot of pressure on the produce to get maximum juice expulsion. Many people who use hand juicers feel that the juice produced is purer and contains more vitamins and minerals. This is because the manual application of pressure does not allow the juice to heat up, which can destroy some of the nutrients in the juice. Just keep in mind that hand juicers take longer to use and aren’t suitable for producing large amounts of juice at one time. That said, they are often more compact so they don’t hog as much room on your countertop. Electric juicers will allow you to produce larger amounts of juice at one time, but you will have to feed the produce in piece by piece so you can’t just let the machine do all the work for you. There are different types of electric juicers on the market, with some heating the juice up more than others. Twin gear or masticating juicers are the best way to go if you want an electric juicer that doesn’t destroy minerals and vitamins with excessive heat. These juicers do not process as fast as single gear or centrifugal juicers, so they don’t allow as much oxidation to occur. If you are concerned with time, you will need to purchase a very good electric masticating juicer. Look for a machine that doesn’t clog easily and that leaves very dry pulp behind. Keep in mind that not all electric juicers work well with wheatgrass or other leafy greens and few work great with citrus fruits. 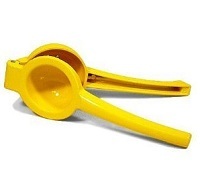 Most people will have an electric juicer on hand for vegetables and harder fruits while using a hand juicer for citrus. For wheatgrass and greens with very fine veins, look for a top model masticating juicer or just purchase a wheatgrass juicer if you make enough to justify the cost. 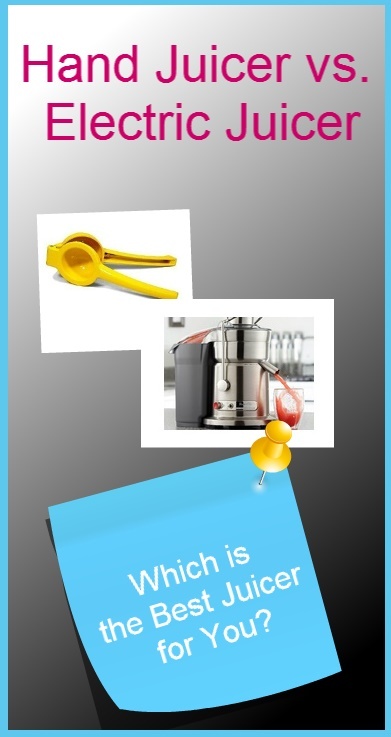 There are definite benefits to both hand juicers and electric juicers. You have to determine what you need and what your expectations are from the juicer. You can then determine which type is going to meet your needs to the highest degree. Then you are ready for the fun of shopping for specific juicer models. That is where the big decisions come into play!